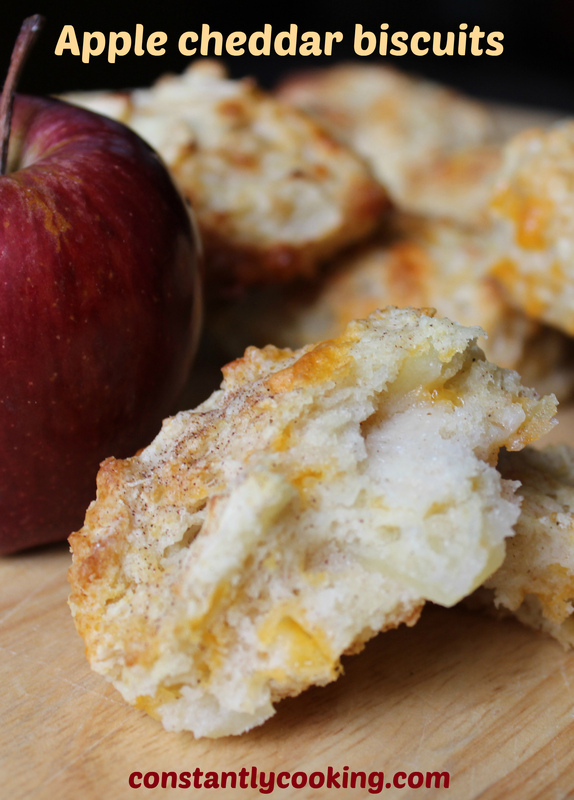 A fast, guilt-free way to enjoy the taste of pie for breakfast! I learned about the glorious delights of leftover pie for breakfast at a very young age. It was well worth waking up extra early so I could sneak into the kitchen and enjoy the remains of the previous night’s dessert. 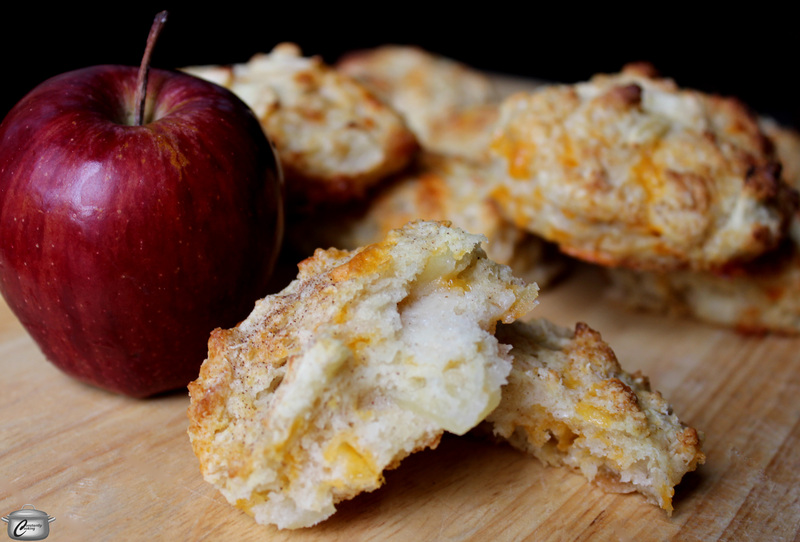 This biscuit recipe captures the essence of apple pie, brimming with fruit and cinnamon, plus the requisite cheddar accompaniment, which in the case of these beauties, is tucked inside. My family loves them for grab-and-go breakfasts and they’re super packable for snacks or lunches. I like to speed up the process by preparing the apples the night before; I just cover the bowl and refrigerate them until I’m ready to start baking. Similarly, you can grate the cheese and pop it in the fridge plus measure out the dry ingredients. Do this advance work and it will take less than five minutes to get biscuits into the oven in the morning. It’s up to you whether you serve them with a scoop of ice cream or not. Combine cinnamon and 2 tablespoons (30 mL) sugar; remove 1 teaspoon (5 mL) of the mixture and set aside. Toss sliced apples with lemon juice plus 2 tablespoons (30 mL) of the cinnamon and sugar mixture. Set aside. With a box grater, grate the cold butter into the flour mixture and toss with your fingers to combine. Add apple mixture, milk and cheddar to the flour and butter mixture. Stir quickly with a wooden spoon, just until the dough comes together. If it seems too dry, add an additional 1 tablespoon (15 mL) of milk. Turn the dough out onto a clean, lightly floured work surface and draw it together with your hands. Pat the dough into a 1/2 inch thick rectangle and cut into 12 – 15 biscuits with a biscuit cutter or sharp knife. Place biscuits one inch apart on the parchment-lined baking sheet and sprinkle tops with reserved 1 tsp of cinnamon sugar. Bake until golden, about 15 minutes. Serve warm or at room temperature. Remaining biscuits can be wrapped individually and frozen. This entry was posted in baking, Breads, Breakfast, brunch, cheese, Fruit and tagged apple, apple pie biscuits, baking powder biscuits, biscuits, biscuits that taste like pie, breakfast, brunch, Cheddar, cheese, cinnamon, fruit, lunch, make-ahead biscuits, Paula Roy, scones, snack. Bookmark the permalink.